I have to express my deep gratitude and appreciation to all great and highly respected Egyptologists and Egyptian Hieroglyphic linguists who spent immense sincere efforts trying to decipher the most arduous and complex written language in history of mankind. A script that was born at immemorial bygone eras then continued for long thousands of years and discontinued for more than 17 centuries since year 390AD. I have also to admit that without their honest and dedicated work my theory would have not been setup or born. I believe that those great savants are real dedicated Egypt lovers. If there is any scientific critique, review or correction to work of those great savants, anywhere in this document, then that does not mean at all any intention to degrade, disrespect those great folk or to mislay or omit their important and essential historical works. It is quite normal that there should be some mistakes at the beginning then sciences develop and enhance with elapse of time. Certainly Young, Champollion and many others made great efforts to decipher Hieroglyphs. In my opinion, their Great break-through historical discovery is that they told us that those Egyptian Hieroglyphs are components of well-integrated language. Since that time Great Egyptologists tried to build up strong bases for this extremely compound language. On the other hand, if some modern Egyptologists or Linguists insist to deny or ignore the new proved discoveries and correct modifications regarding the Ancient Egyptian Language and their consequences and cling to the older fundamental mistakes then they will surely lose their merit and professional respect within most of scientific and popular media. Consequently, they will extremely harm the great accomplishments of the early generation of great Egyptologists. Ritva Kurittu, Hosneya Farid, Amani Amin, Magda Shebaita, Andrew Bayuk, Avry Wilson, Jack Dean, Joseph Davidovits, Peter Vanderzwet, Done Barone, Bill Meek, Nicholas Armstrong, Chris Sangwin, Joel Laird, Terance Pete, Adam Zayed, Ahmad Al-Garallah, Ahmad El-Barbari, Hassan M. Hassan, Ibrahim Guda And likewise many other friends, Egypt lovers and Egyptians. When I started my renewed research work about true Egyptian Hieroglyphs in 1992, it was a pure scientific drilling in linguistic data. I have never expected to end in jostling with religious creeds. However, I was overtaken that 90% of AE writings are related to ancient religious creeds, which, to my great surprise, relate to nearly all current heavenly doctrines. Therefore, I decided to continue my work taking into consideration that I should treat these texts, apart from the religions, as a substance of historical document that should be investigated from lingual and historical points of view. When I mastered reading Hieroglyphs truly, to a reasonable extent, I realized that Christianity was not born in year 1 AD as we have learned. In fact it was reborn at that date, and it was really born thousands of years BC, as I have read in AE scripts, which you will read in this book. The same holds good for Islam. Islam was only reborn in year 571 AD. It was really born thousands of years before The Christ. Once more, the same holds good for the Hebrew religion. David was again reborn round year 1000 BC. David, Jesus and Mohamad, all of them, were reported, quite clearly, in Ancient Egyptian mural and papyrus documents. This you, dear reader, will be able to read in this book. AE religion contained all these beliefs. It happened that each group of peoples adopted what they believed that it is right. The problem is that each tribe wants all other tribes to believe as they do, even if by force!! This is extremely illogic. Neither all peoples like to eat apples, nor do others like to eat oranges! Why doesn't man believe what he likes to believe without interference from others? I think that this is a real problem of mankind. The real start of my research work was in year 1966. I was a cadet in the Military Technical College, MTC, of Cairo when I visited my father in Aswan who was Vice Minister of Egyptian Education Authority for South Egypt. In front of one mural text, a friendly American tourist kindly asked me: could you read this Hieroglyphic text? I said, No! He said again, what a pity, your ancestor forefather is leaving a message to you on this wall, which is surely very important, and you are not able to read it! I realized afterwards that this is also a big mistake. The true phonetic value of the recumbent lion is (rb), not L. It is a bilateral phone but not 'phoneme'. It is also classified by professional Egyptologists and linguists under [r] section! This means, simply, that apparently there was no L sound in all Ancient Egyptian epochs, which is again illogic, because the Ancient Egyptian L phoneme was clearly transferred to Hebrew, Greek, Coptic, Arabic and even English languages by the very same sound and grapheme! Hereford, I discovered that at least 7 Hieroglyphic signs have a sound root of L! This was a real foundation on which my whole theory of true Hieroglyphs was built. By more study, I discovered more 5 fundamental mistakes made by Champollion. When I rectified it, the real picture started to appear gradually. With passing of time, elements of my theory were born. In this book, I'm trying to explain elements of my new theory of true Hieroglyphs in brief. I know that it will be so hard to conceive it at first sight, but I'm sure that it will be recognized step by step. This book should be as four times in volume as it is here, but for some reasons I decided to part it into successive volumes. Therefore, I hope that I'll be able to continue with coming volumes in near future, or as we say, insha2allah! Finally, I apologize for any inconvenience if there is any. I - Phonetic correction of wrongly deciphered basic Egyptian Hieroglyphs. II. 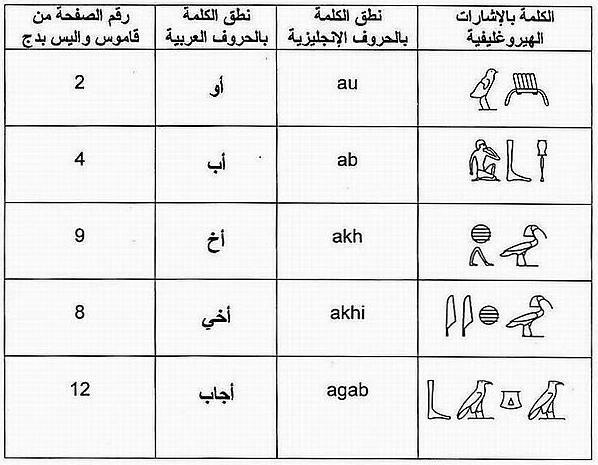 Classifying mono-phone Egyptian Hieroglyphs into one Phoneme Table. III. Classifying all other Egyptian Hieroglyphic graphemes that have 'bilateral' phonetic values into one basic, or multiple Bilateral Tables. IV. Introducing concept of motorizing letters, to the first time in History, discovered by Ossama Alsaadawi. V. Detection of real "general conceptions", and meanings of different Hieroglyphs. VI. Using basic Hieroglyphs as integrated whole words. VII. Using Hieroglyphs as phonetic values in composing different Egyptian words and expressions, in independence to their general conceptions or meanings! VIII. Negation and forbidding signs, and calling signs in AE language. IX. Creating a dictionary and vocabulary of radical AE short-handed Hieroglyphic expressions with its real meanings. X. Proving the firm stability of Oral Egyptian language along whole wide Egyptian history, starting from pre-dynastic times and up to now. XI. Explaining the True Ancient Egyptian Grammar of Hieroglyphs. XII. Detection of the real names of the Ancient Egyptian divine characters know wrongly as the Egyptian gods and goddesses! XIII. Deciphering the real names of Ancient Egyptian Kings by correct deciphering of all Egyptian Cartouches. XIV. Deciphering mural and papyrus pictures, which compose an essential integrated complement to Hieroglyphic texts. Studying current slang Egyptian language may help much in better understanding of Hieroglyphs. Nearly, all AE expressions and names are still alive in Egypt. Egyptian language is a unique international language. In fact, it is the mother source of many other languages. Arabic is one of them. This uniqueness of the Ancient Egyptian language came from the fact that it is based mainly on bilateral phonetic values, which is the natural and instinctive utterance of words spoken by mankind! to those in temples of the Roman period"
[G5], the falcon, was not changed. [Y5], "men" sign, was not changed. [S33], the sandal, was not changed. [S1], the white crown, was not changed. [S3], the red crown, was not changed. [F31], "ms" sign, was not changed. [U6], the hoe, was not changed. [N5], "Ra" sign, was not changed. [O40] , the stairway, was not changed. [N35], water ripple, was not changed. [D43], arm holding flagellum, was not changed. Likewise, I can count hundreds of such Hieroglyphs that were not changed, a bit! imn - iman, which means "faith, believe"
A well-known AE word that is still be used among present Egyptian peoples, yet, all over the world! ya , " O' "
and is still be used currently in Egypt. It carries the same "Arabic" phone with the same meaning! yara. It means, "to see"
AE word that is still be used in Egypt, AND in "Arabic" world! dn, deen. It means, "Religion"
[U15], tm, "to finish, finished"
AE word that is still be used in Egypt, AND "Arabic" world. AE word that is still be used in Egypt, AND in "Arabic " world! AE word that is still be used in Egypt, AND in "Arabic" word! Likewise, I can report hundreds of similar words! On the other hand, if we examine carefully the Egyptian language in the period, 700 AD - 2000 AD, then we conclude also that this spoken language has not changed a bit either, because it is based on firm "oral" expressions taken from religious texts. Of course, historical records prove this fact. Once more, if we examine carefully names of the Egyptian peoples during the Coptic era, 50 AD - 640 AD, then we find that more than 90% of these names carried "Arabic Phones", even before Arabs invaded Egypt! Likewise, I can count hundreds of such "pure" Egyptian names that have Arabic phones even before Arabs came to Egypt. Those people were "NOT" Arabs!! They were Copts. Moreover, if we revise some "Egyptological" references, one can easily find many of these names or phones recorded over there! These Coptic names are still alive in Egypt today. Some people think that these names are Arabic names, but they are wrong. These names are PURE Egyptian names that survived from far Ancient Egyptian times up today.